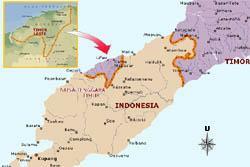 ETLJB 06 October 2012 1046hrs EDST - Terrorists from Saudi Arabia and other countries have entered East Timor from Indonesia according to the Commander of the Indonesian National Armed Forces at the Batugade Border post, Infantry Major General Hengky Yuda Setiawan from the Yonif 321 battalion. The terrorists were in the Indonesian province of Nusa Tenggara Timor but escaped into East Timor, according to a report by Jornal Independente published last Monday, 01 October. Commander Hengky met directly with the Commander of the the East Timorese Border Police Unit (UPF) to ensure that they stay vigilant and alert for these member of terrorist groups although there is no apparent evidence that the terrorists have infiltrated either the East Timorese or Nusa Tenggara Timor communities. "I am concerned about these people, but by working together, we can tighten up the border to combat all bad things," he said, at Mota Ain, Batugade, on Saturday 29 Sept 2012. On the same occasion, the commander of the UPF Superintendent Agostinho Gomes said that other work of the UPF was to identify and counter foreigners illegally entering Timor-Leste during this time, which did not include just Indonesians or Timorese, but Chinese, Sudanese, Afghan and even Russians. He added that the UPF was also concerned that there were many illegal entrants into Timor-Leste, which, in the future, may have undesirable consequences for Timorese with more hard times to come because they would have less jobs and housing for themselves in the future.